Because the body needs food to survive, anorexia is one of the most physically dangerous behavioral health disorders. If you or a loved one has anorexia or a similar eating disorder, there are many places to go for information, support, and referrals. Many people with the disorder are hesitant to seek help for many reasons, such as shame, fear, or denial of the severity of their condition. Calling a helpline can be a non-threatening way for you to obtain the initial information, resources, and encouragement you need. Anorexia hotlines can provide anonymous support, information, resources, and treatment options for people suffering from anorexia or related eating disorders and their families. While the staff who answers can refer you to therapy and treatment, they cannot provide the treatment services, offer professional counseling, or make any diagnoses. Helplines are often staffed by volunteers who are not licensed counselors, therapists, or medical professionals, but are trained to offer support and information for the issues you have. These hotlines are also not the appropriate place for emergency or crisis situations. If you are experiencing a crisis, call a local or national crisis line for support or 911 for medical emergencies. Many helplines are available exclusively for those with anorexia and related eating disorders. Additionally, there are many general mental health and behavioral addiction hotlines ready to provide helpful eating disorder information and support. Do your research before calling a helpline to ensure that it is a reliable and reputable source. Most hotlines have toll-free phone numbers; some hotlines, however, may have regional numbers, in which case, long-distance rates may apply. NEDA’s hotline provides support, treatment options, and other resources to people seeking eating disorder treatment. The hotline is open Monday–Thursday, 9 a.m.–9 p.m. EST and Fridays from 9 a.m.–5 p.m. EST. It is not open weekends or most holidays. In addition to the hotline, NEDA also provides a live chat option on its website, as well as a text line that can be reached by texting “NEDA” to 741741. ANAD’s Eating Disorders helpline provides support and encouragement for those affected by eating disorders. They can help you process feelings, get through a meal, or talk you through urges to binge and purge. It also provides support for family members concerned about their loved one’s eating disorder. The hotline is not toll-free and long-distance charges may apply depending on your telephone service provider. Current operating hours are Monday–Friday, 9 a.m.–5 p.m. CST, with plans for a 24-hour helpline in the future. The National Mental Health Association provides a toll-free information line where you can be directed to your local mental health association and to support groups and community resources. Mental Health America provides a toll-free 24-hour crisis line for people who need support, regardless of the time of day. It also offers a text crisis line, which can be reached by texting “MHA” to 741741. SAMHSA provides a free, confidential 24-hour information and treatment referral hotline for people and families affected by mental health disorders and behavioral addictions. It provides information, community resources, support group information, and treatment referrals. It also sends out free publications on mental and behavioral health issues to those who request them. NAMI’s helpline answers questions about mental illness symptoms, diagnosis, treatment options, and legal issues. It does not provide therapy or counseling, but can offer referrals to local support groups, therapists, and treatment centers. The hotline’s operating hours are Monday–Friday 10 a.m.–6 p.m. EST. Crisis Text Line (text “Home” to 741741): Crisis Text Line is a free 24-hour text line for those in crisis. Texters reach a trained crisis counselor who provides active listening and offers you coping skills. The text line is appropriate for those who have a mental illness, eating disorders, substance abuse, relationship problems, and suicidal thoughts. Many people with an eating disorder may also experience what’s known as suicidal ideation at some point in the progression of their illness or recovery. If suicidal thoughts and feelings become persistent or urgent, it may be best to call a suicide hotline first. The National Suicide Prevention Lifeline provides free and confidential support 24 hours a day, 7 days a week to anyone having suicidal thoughts or feelings. The hotline is linked to a national network of local crisis centers trained to provide emotional support to anyone in distress or suicidal crisis. In addition to providing emotional support, helpline staff can provide referrals to community resources such as therapists, psychiatrists, and support groups. Attia, E. & Walsh, T. (2007). 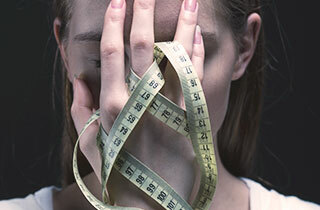 Treatment in Psychiatry: Anorexia Nervosa. The American Journal of Psychiatry, 164(12): 1805–1810. National Eating Disorders Association (NEDA). Anorexia Nervosa. Berger, F. (2016). Anorexia. U.S. National Library of Medicine.